Olivia Cleans Green: Who Wants Bleach in Her Vajayjay?! Who Wants Bleach in Her Vajayjay?! What you put in your hooha is your business. It doesn't have anything to do with the government, the Church, or your parents. It's your prerogative whether you're choosing a lover, birth control, or feminine hygiene products. Still, some choices available to us modern women confuse me. Case in point: chlorine bleach whitened tampons. 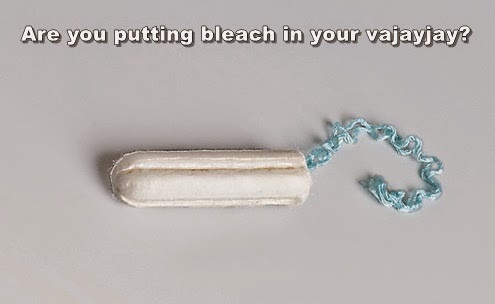 Most tampons are bleached with chlorine. The chlorine breaks down into dioxin, which remains in the bleached product. Dioxins are highly toxic and can cause reproductive and developmental problems, damage the immune system, interfere with hormones and also cause cancer. Check out this video to learn more about dioxins and feminine hygiene products. I love that I can walk into a store and choose between a dozen brands of tampons. However, women have the right to make informed choices. It angers me when corporations that make products for us aren't forthcoming with information about what's in their products, how they're produced, and how this impacts things we care about, like, you know, not getting cancer. As members of post WWII society, we're all born with hundreds of toxic chemicals swimming around in our bodies but it'd be nice if we could start to have more of a choice in the matter. Hopefully one day we'll live in a world where dioxin and vajayjays never cross paths. Until then we must educate ourselves and seek out alternative products. If you wanna support a family company that isn't sneaking chemicals into your cha-cha, look for Maxim tampons in your local health food store or buy them online. Use my coupon code "AF112" to get 10% off your online purchase of any Maxim Hygiene product. To learn more about other choices you have to keep chemicals out of your body, attend my Spring Detox Workshop at Sustainable NYC on Sunday March 29, 2015 at 3pm.